Nintendo is headed to WonderCon in Los Angeles March 25-27 with a great collection of Wii U and Nintendo 3DS games, including the first publicly playable version of Metroid Prime: Federation Force for the Nintendo 3DS family of systems. Additionally, there will also be a panel and meet-and-greet dedicated to Hyrule Warriors Legends featuring developers from the game, as well as other fun activities at Nintendo’s booth in the Los Angeles Convention Center. Show attendees will be able to play Star Fox Zero and Star Fox Guard before the Wii U games launch on April 21. Star Fox Zero is a flying and shooting game starring legendary space pilot Fox McCloud. Players will blast through an onslaught of enemy forces to bring peace to the galaxy. In this white-knuckle space shooter, it’ll take more than luck to master the Arwing jet, the Gyrowing flight drone and the Landmaster tank. Additionally, attendees can experience Metroid Prime: Federation Force, a game that focuses on co-op multiplayer missions. 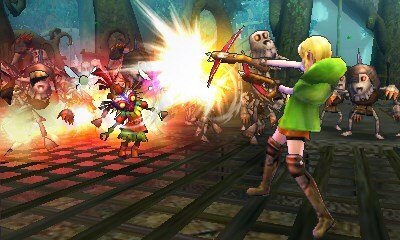 Up to four players, each with her or his own Nintendo 3DS system, take on various missions within the Bermuda system, battling intergalactic creatures and solving puzzles. This will be the first time the public will have hands-on time with the Nintendo 3DS game before it launches this spring. On Saturday, March 26, in room 515A in the Los Angeles Convention Center, Nintendo will host a panel from 6 to 7 p.m. featuring team members from Koei Tecmo, the developers of the Hyrule Warriors Legends game for Nintendo 3DS. The developers will discuss creating the game, which brings all the action of the hit Wii U game to Nintendo 3DS, and they will also dive into some of the new characters like Linkle. The panel is sure to be informative and interesting for not only fans of the game, but also anyone who has interest in game development. On Saturday from 11 a.m. to 1 p.m., the developers from Koei Tecmo will participate in a meet-and-greet in the Nintendo booth. This is a great opportunity for fans to ask them questions about their work on the game, take a memorable photo or even bring their Hyrule Warriors Legends game to be signed by the awesome people who made it! WonderCon, created by the team behind Comic-Con, is a convention celebrating the world of pop culture. The Nintendo booth (No. 1836) is open to WonderCon attendees with a badge during show hours from March 25 to March 27. The Los Angeles Convention Center is located at 1201 S. Figueroa St., Los Angeles, CA 90015.